New year, new start: this is a popular time for businesses to polish up their designs. But design trends are always changing and almost every day, a major company alters its visual identity. In this series, 99designs will be highlighting the rebranding efforts of companies big and small. Hover your cursor over the images to compare and contrast the companies’ old and new logos. Tell us what you think about these rebrands in the comments section! AIS’ old logo was seriously outdated and was in dire need of a revamp. This new one consists five gold lines that form the shape of Australia. It definitely packs a better punch, communicating speed through its dynamic line work. The reflective gradient is also a good touch. The font for AIS could use be a little thicker, but apart from that, AIS is definitely going for gold on this one. Implementing this new design cost the Australian Industry of Sport a total of $500,000. Do you think it is worth it? Sometimes, going back to your old roots is the way to go. The original Art Directors Club logo was a graphic interpretation of the signature of Albrecht Dürer – one of the first high profile commercial artists. Since 1920, the Art Directors Club has changed their logo 20 times. All versions were variations of the initials ADC until recently, when the logo changed to a simple wordmark with a bright pink color. Now, returning to its roots, the Art Directors Club decided to go back to the traditional logo, and is now known as “ADC”. Some tweaks here and there can result in a really fresh rebrand. Netgear got rid of the dark blue color and opted for a more lively purple. They also worked on their kerning and added some “faceted graphic motifs” to accompany their wordmark. This small change is very appealing to the eyes. It’s like Netgear got rid of their baggy suit and purchased a well-tailored, slightly flashier one. Another slight change from one of the biggest companies in the world. Visa removed the iconic yellow flap on the letter V, and gave the whole wordmark a blue gradient. It didn’t really make sense to change the logo like this, as it worked well with the blue and the yellow. Visa loses its uniqueness by removing a color that distinguished its logo. According to the company, “Visa is introducing a new visual identity for one of the most recognized and powerful brands in the world.” In actuality, it is so much easier to lose this logo in the sea of gradients out there. Cadillac‘s crest always had too much going on. 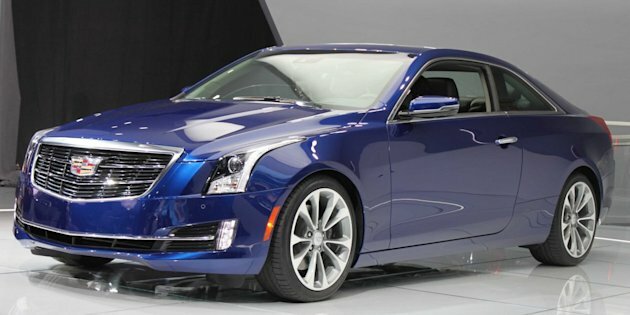 With this new redesign, Cadillac kept the crest, but removed the wreath. The new logo still has its intricacies, containing three different colors as well as multiple patterns on these colors. The logo does work well with their cars since it now has only one component instead of the more unwieldy two. My only problem with this one is the amount of detail it has. It gets a little distracting; having that many colors on a car can really throw off the whole look. The Marriot hotel chain got rid of its medieval-ish font and opted for a plain sans serif look. They did keep a slightly modified version of the M from their previous logo and now use it as their main logo. The M also doubles as an H, and it is a simple way to use MH as their initials. The company could have chosen a better font for Marriott and perhaps kerned the letters closer together, as they currently look very distant. The simple change from Marriott was not absolutely necessary, but it is a welcome change in this new age of simplicity. Black + Decker changed two things: one was changing its name from “Black & Decker” to “Black + Decker”; the other was updating its brand personality. This new logo exemplifies that. The old logo was rugged and manly, while this new logo shows a softer and more personable look. The change was meant to change the company’s brand identity to a more personable, “anybody can use our tools” vibe. However, the screw shouldn’t have been removed, since it has been an iconic symbol for the company. A lot of history on this one. It only makes sense not to change too much about this iconic girl under the umbrella. At first glance, it looks like nothing was changed. But in fact, there are some very small but key updates to this logo, including the simplification of the lines on the drawing and the amount of salt being spilled. The wordmark also got a much-needed change with the spacing of the letters. This one was a little disappointing. You could argue that the old Oxford Dictionaries logo was plain, but that was the point. It had the same font as the dictionaries and it was simple. The change, using a “OD” monogram, screams blandness. There is no originality to this one. Beats by Dre anyone? Probably one of the better changes of this month. The Oscars got a much needed revamp of their old shiny logo. The new logo is elegant and simple. The oscar statuette is still there, but it is now inside the A. The A with the statue can also be used as a standalone logo. What do you think about these rebranding efforts? Tell us in the comments!